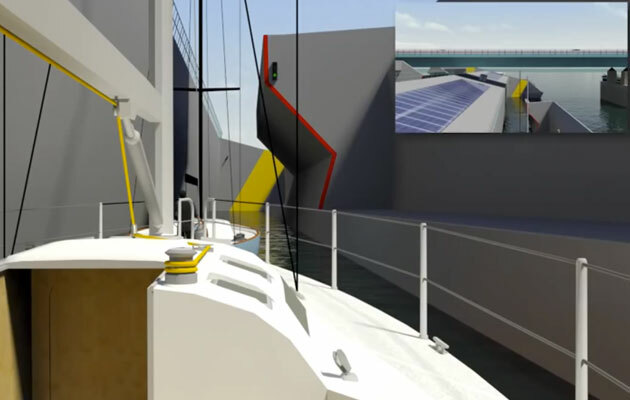 Dutch engineers at Royal HaskoningDHV have invented a tilting lock that will allow yachts to pass under major road bridges with no need for them to open. Major bridges that move to allow sailing yachts to pass beneath them, like the Zeeland Bridge in the Netherlands, are causing daily traffic congestion when they open for boats, peaking during the summer season. To solve this problem, Royal HaskoningDHV has invented the Tilting Lock, which is designed to allow boats to ‘submerge’ under the bridge instead of it opening for them to pass under. The Tilting Lock (Kantelsluis) is a floating structure which has two separate water filled channels with space for five yachts at a time. When the lock is level, the water surface in both channels is 4 metre lower than the water in the river. To start service the lock will tilt in order to raise the level of one of the channels to meet the water level outside the Tilting Lock. The energy used by the Tilting Lock is extremely low. Mr Poldervaart continues: ‘The lock tilts 32 degrees in three minutes and it takes 30 seconds to set the tilting ‘in motion’. In normal weather conditions this uses 0.04 kWh – as little as an ecolamp needs to burn for four hours.’ Stopping the tilting produces energy, as do the solar panels on the lock. This energy will be used to tilt the lock and for lighting, as well as opening and closing the lock doors. The lock will be made of steel and will be built at a wharf and then transported to its final location, enabling 15 to 30 ‘oversized’ yachts per hour to pass the bridge without it opening. Capacity may vary depending on width and length of the lock. Smaller sailing and motor yachts will still be able to pass the bridge as normal. The Tilting Lock can also be used as an energy efficient ordinary lock with no water being lost when moving ships from higher to lower water levels – a persistent problem in canal systems that are dependent on rainwater to maintain sufficient water depth.